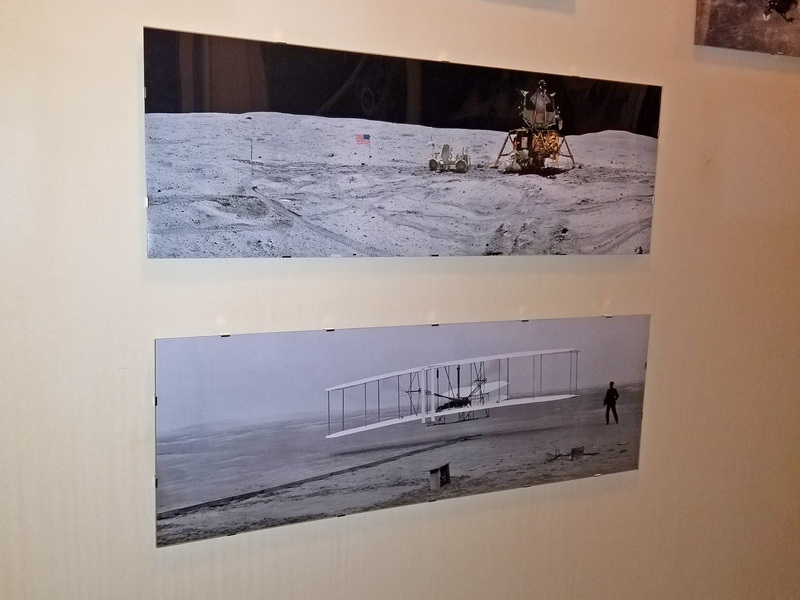 I added a new 12×36″ enlargement to my refreshed hallway gallery today, a 1:3 aspect ratio crop of a high-resolution scan of the photo of the first flight of the Wright Flyer on 17 December 1903 at Kill Devil Hills, North Carolina. 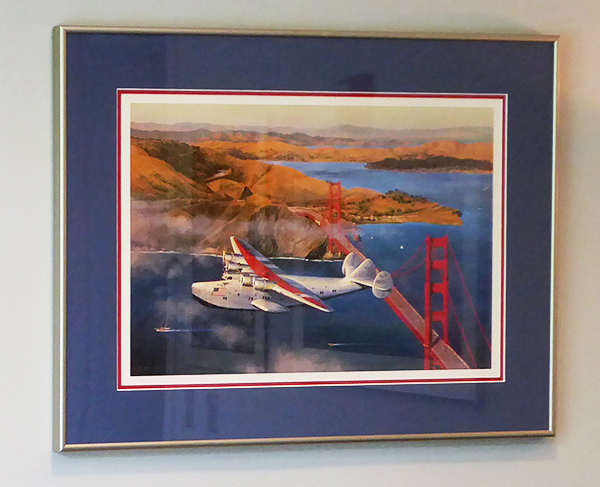 Orville is piloting and that’s Wilbur at the wingtip. John Daniels, one of the five witnesses to the flight, took the photograph with Orville’s pre-positioned camera – so awed by what he saw that he almost forgot to squeeze the bulb to capture this image on the 5×7″ glass plate negative. From the Flyer to the Apollo 16 Lunar Module Orion above it was a span of just sixty-eight years and four months. The full-size first flight image from the Library of Congress can be found here – be aware that it’s 27MB. Edited to add: The comments here include a discussion in some detail of the soon-to-be-released film “First Man” and HBO’s 12-part 1998 series “From the Earth to the Moon”. August 2018 update: See also the companion article Don’t get me started, in which Apollo 17 LMP Jack Schmitt describes a mind-boggling workaround they could attempt if the ascent stage launch pyrotechnics failed to fire. 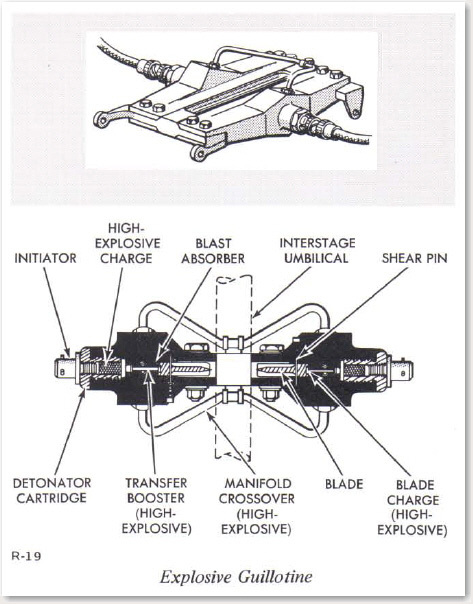 In missions past and present, explosive devices feature in pretty much every spacecraft because they’re a safe, reliable way to ensure that processes start, items such as antennas are deployed, and connected assemblies that need to come apart are quickly and cleanly separated. On the Apollo missions, over 210 pyrotechnic devices were in the Saturn V stack and the Command, Service, and Lunar Modules, used for everything from extending the LM landing gear to deploying drogue and main parachutes to ensuring fuel was at the correct side of a tank – for which the word ullage (in French, ouillage) was borrowed from vintners, to whom it means the headspace between the top of the wine and the container it’s in, whether a cask or a bottle. Though these devices were known to be generally reliable, a certain level of trepidation about them is understandable. Blowing up some high explosives to drive a big blade through wires doesn’t exactly sound like the most controlled process even though it actually was. In Chariots for Apollo by Pellegrino and Stoff, a somewhat sensationalist telling of the building of the Lunar Module at Grumman*, they speak of Joe Kingfield, the director of quality control. 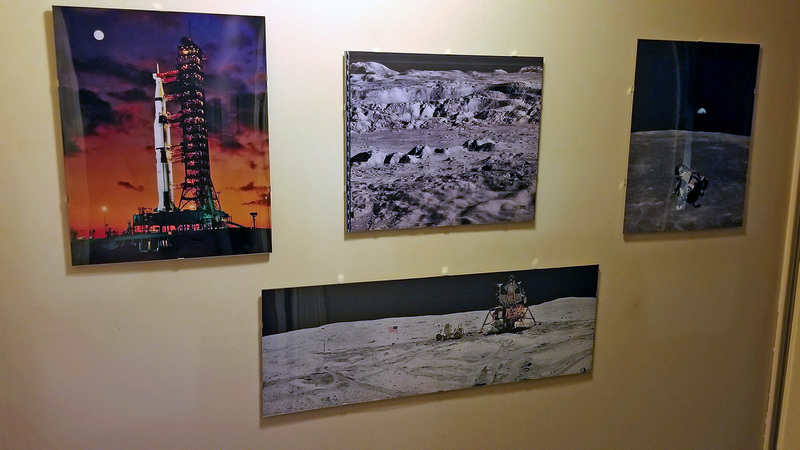 I won’t quote them directly since they went over the top with their narrative, but Kingfield had frequent nightmares about the liftoff from the moon that involved the guillotine and one or more of the explosive bolts failing. In his dreams, the ascent stage lifted off, but, still connected by miles of wire, dragged the descent stage along the ground and eventually crashed back into the surface. In later years, Kingfield still could not bring himself to watch the footage of the lunar liftoffs taken by the Mission Control-directed TV cameras on the Lunar Roving Vehicles of Apollo 15, 16, and 17. *Not to be confused with the unimpeachable NASA volume of the same name by Brooks, Grimwood, and Swenson; web and epub links at the link. 2018 update: You can get a free high-quality scanned PDF of this book and many other official NASA histories – see the I got mine at the GPO bookstore post for the NASA Technical Reports Server links. 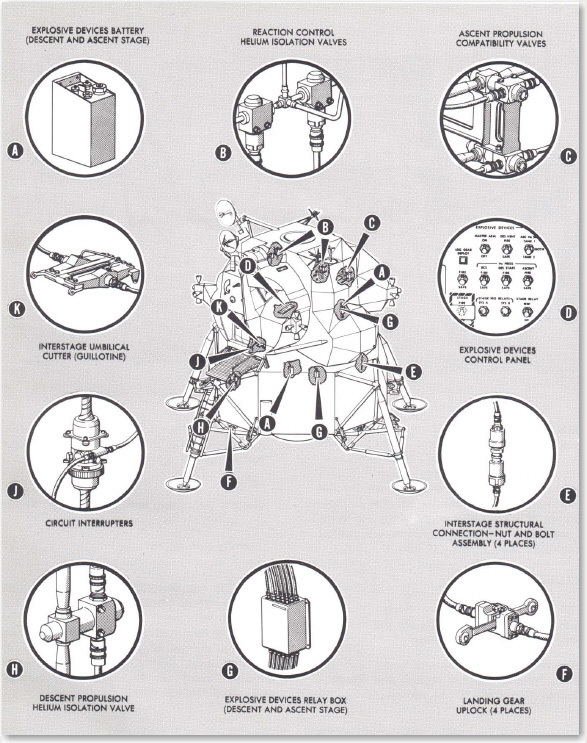 Charlie Duke, Lunar Module Pilot of the Apollo 16 Orion (the LM pictured in the Finley Quality Network banner above), said that the pyrotechnics for the ascent stage separation gave him brief pause just before he and Commander John Young lifted off from the moon. When the circuit interrupters fired, then the four interstage bolts at the corners were sheared, and finally the guillotine sliced through the umbilical and water lines, the entire ascent stage suddenly dropped an inch or so. 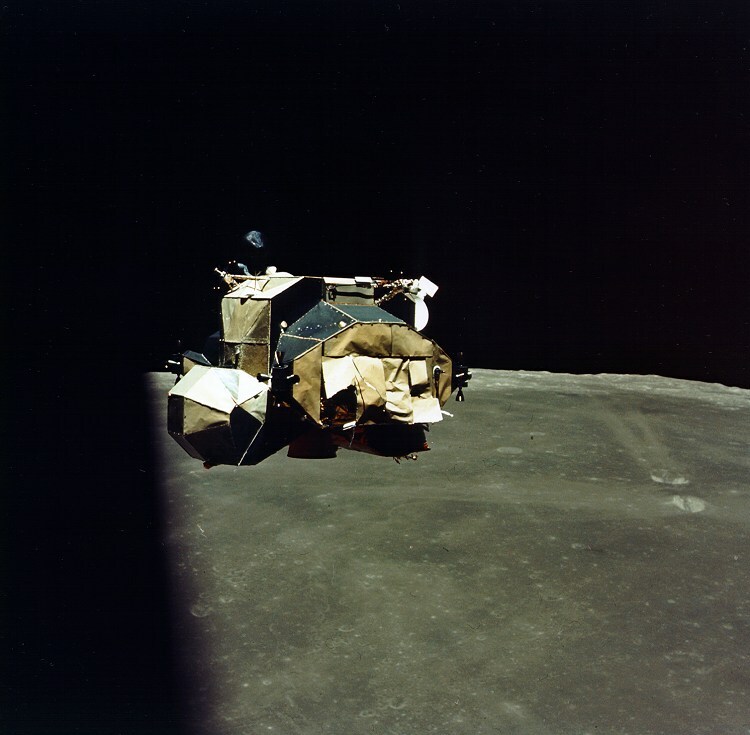 Duke thought, “Oh, sh…” but did not have time to finish that thought as the ascent engine fired and abruptly took them away from the surface back toward Ken Mattingly awaiting their return aboard the Casper Command and Service Module in lunar orbit. The most probable cause of the failure was ascent engine exhaust entering the cavity behind these thermal shields. A cross section of the lower edge of the shields is shown in figure 14-27. Analysis shows that the thermal shield which extends below the support tube allows a pressure buildup on the closure shield which exceeds its capability. Once the closure shield failed, the exhaust entered the cavity behind the shield, resulting in a pressure buildup exceeding the capability of the vertical thermal shields. In the lunar surface photographs taken prior to lift-off, some of the shields appear to have come loose from the center standoff (fig. 14-28). Excessive gaps between some of the panels are evident. Both conditions could be caused by excessive pressure in the thermal blanket due to insufficient venting during boost. The corrective action will include a redesign of the thermal shield to eliminate the projection below the support tube, as shown in figure 14-27, and to provide additional venting to the blankets as well as additional standoffs. Not one problem was detected in any of the pyrotechnics during any Apollo mission. 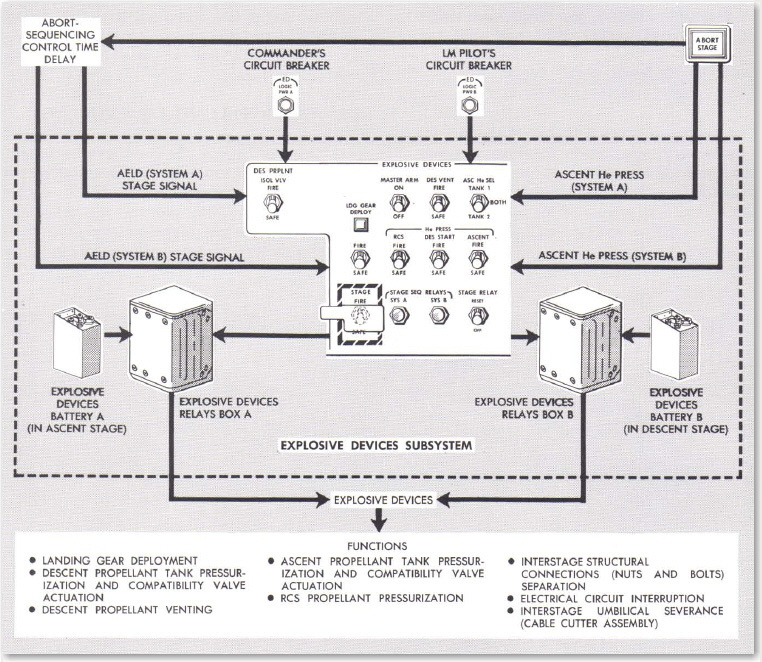 The device designs used in Apollo were later adopted by the Shuttle program, with, for instance, the Single-Bridgewire Apollo Standard Initiator (SBASI) becoming the NASA Standard Initiator (NSI).